In a city of plenty, it's surprising that buyers don't have more options for their searches. 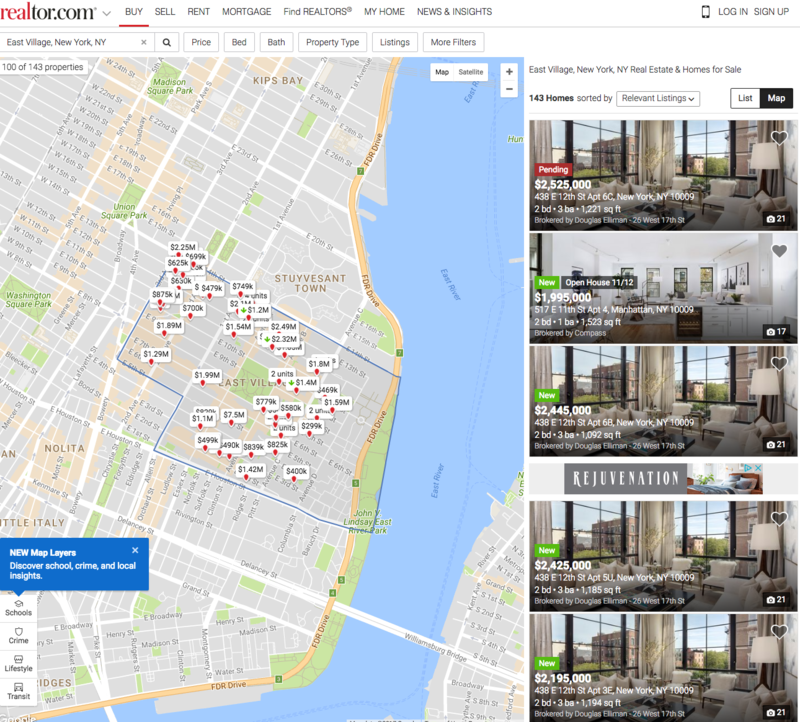 Given that New York City is a town of both abundance and abundantly expensive real estate, where renters can hunt for apartments via a seemingly ever-expanding number of rental search sites, the comparative lack of listing websites for buyers in search of co-ops, condos, or brownstones seems surprising at first. It makes a bit more sense when you consider the fact that 70 percent of New Yorkers rent versus own, the exact opposite of the rest of the country. And you may even start to feel grateful that there are only a handful of listings portals to consult when you realize you may need to monitor all of them to cover your bases when searching. “Depending on what’s important to you as a buyer, each site has a different strength and focus," says Constantine Valhouli, founder of NeighborhoodX, a real estate research and analytics firm. "You need to look at multiple sites because you’ll get different results due to the different data feeds being used, how frequently the feeds are refreshed, the technology specific to each site, and the different ways each site defines neighborhood boundaries." Beyond their listings, search portals distinguish themselves through user experience. There's also an increasing focus on contextual information, Valhouli says, "and what it's like to live in a particular building or neighborhood is also becoming more important." The New York Times recently stopped charging brokerages to publish listings, and partnered with the Real Estate Board of New York, the city's real estate trade association, to feature listings from REBNY's 300 member brokerages (which includes property managers with brokerage licenses), as well as directly from brokerages not participating in the listing service. The result is a vastly improved listings inventory, enhanced by an outstanding user interface. "The interface is probably the best out there—clean and intuitive, and fewer expired listings come up in the results," Valhouli says. "I also like that they are incorporating local knowledge on topics like neighborhood attractions and services into the listings." You can search by neighborhood, minimum and maximum price, and number of bedrooms and bathrooms. Once these terms are entered, you're taken to a map of the apartments for sale in the area. You can also set more specific criteria, including apartment type, apartment and building amenities, and nearby transit. Additionally, you can refine your search by "lifestyle," (e.g. proximity to beaches, golf courses, and bike paths), and listing content (like listings with videos, floor plans, and/or multiple photos). You can also choose to view only listings that have had recent price reductions or have upcoming open houses. Browsing individual listings gives you an even more holistic view of a given apartment: You can see a market snapshot that tracks changes in price over time, inventory, and the average amount of time a listing stays on the market in a neighborhood. A drop-down menu shows what's nearby, including restaurants, arts and entertainment, gyms, medical facilities, and more. "We combine comprehensive editorial coverage of the real estate market with comprehensive listing data in the NYC market," Times executive advertising director Brendan Walsh says. "Our listing details pages pulls in relevant neighborhood content produced by our newsroom." A Times real estate app is also available, and lets you search for homes throughout the world. Like The New York Times, Realtor.com receives listings from REBNY. Listings also come from brokers and other vendors that New York City brokers use to submit their listings and syndicate them. 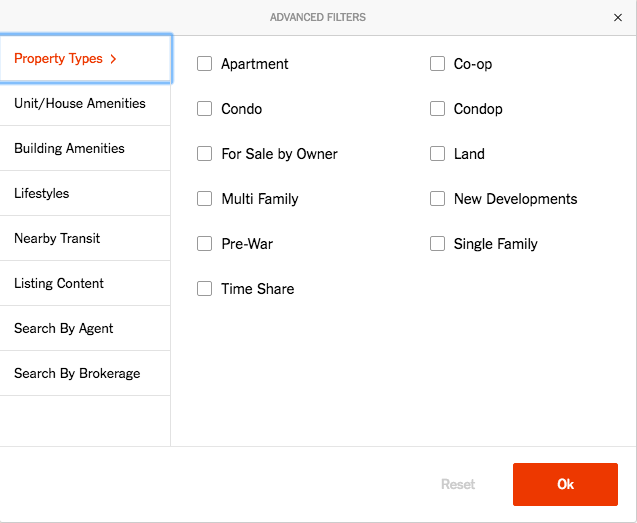 You can explore listings in a list or on a map and browse by price, size, and property type. Other filters include number of days listed, open houses, square footage, and property age. Some of the choices available for amenities are not relevant to the vast majority of New Yorkers (like boat facilities, horse facilities, and lake and river views) while others, like hardwood floors, dining room, laundry, and security features, are right on the money. Clicking on an individual listing provides information like price per square foot, monthly charges, nearby public schools, sales history, and the median listing price for the neighborhood at large. A spokesperson for Realtor.com says listings are updated every 15 minutes, and its app sends users alerts on new listings, price reductions, and open houses. The app's "Sign Snap and Street Peek" feature lets you take a photo of a For Sale sign and get details about that property. 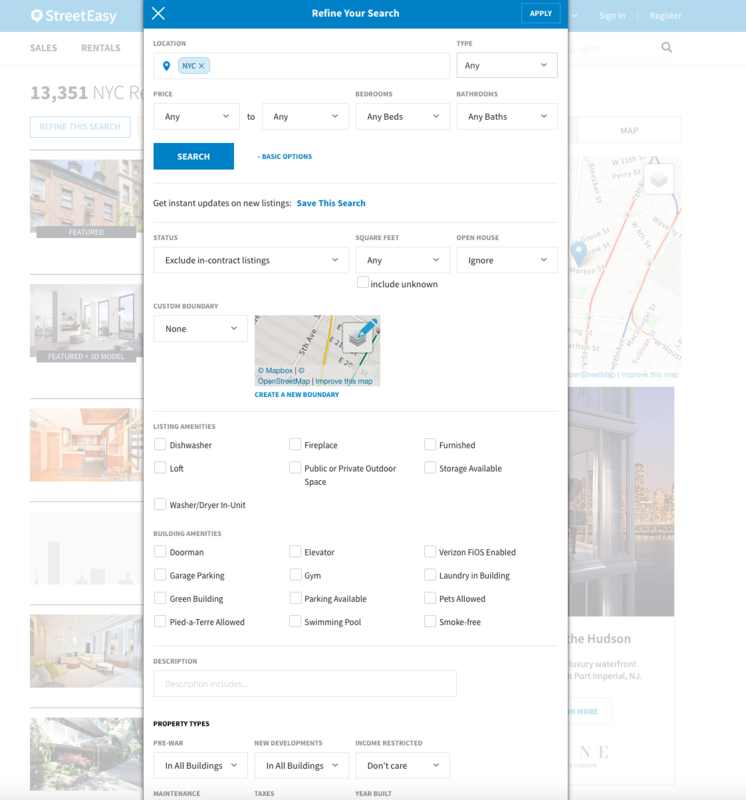 StreetEasy receives listings directly from brokerages, from listings syndications like RealtyX and Nestio, and from individual brokers and sellers. Unlike The New York Times and Realtor.com, it does not receive the REBNY feed. Another thing that differentiates StreetEasy from competitors—and from sister sites Zillow and Trulia—is that it focuses on New York City only. 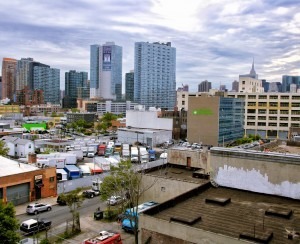 "Where other platforms go wide and need to think through solutions or how to present information that scales across the entire country, StreetEasy is able to go deep and develop experiences on desktop and mobile that are tailor-made for New York buyers, renters and sellers like no other real estate platform can," StreetEasy spokeswoman Lauren Riefflin says. Search sites like StreetEasy are good for window shopping, but they can only take you so far--especially in one of the most complicated and competitive real estate markets in the world. 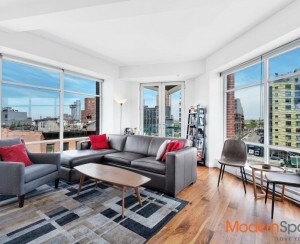 "Whether you’re looking for your next home, a pied-a-terre, or an investment with upside potential, even experienced buyers need a skilled advocate with boots on the ground in New York City,” says Jordana Kava of the Blooming Sky real estate team. “We work with buyers based locally and abroad to identify New York City neighborhoods and properties that meet your exact specifications. We fully inform you of the positives and negatives, negotiate tough deals that put your interests first, and do everything in our power to make sure the the deal gets done—from contract, through board approvals, financing and closing." 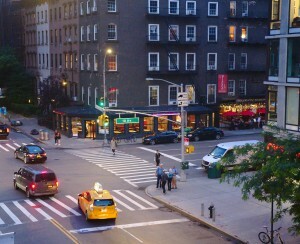 To discuss your New York City real estate goals with the experts at Blooming Sky, click here. That said, if you're looking to buy in the eastern reaches of Brooklyn and Queens, on the fringes of StreetEasy's traditional sphere of influence, you should also keep an eye on StreetEasy's national sister sites Zillow and Trulia, as well as Realtor.com (above). 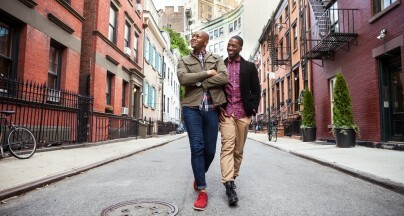 You can refine your search by a number of factors, from the basics—co-op versus condo versus townhouse, number of bedrooms and bathrooms, square footage, and neighborhood—to the specific, including price per square foot and monthly charges, as well as the presence of in-unit and in-building amenities like fireplaces, dishwashers, swimming pools, FiOS wiring, and more. Individual listings include price history, proximity to transit, days on market, and monthly charges, and you can also find information about the buildings apartments are in, to compare floor plans and the sales histories of neighboring units. Much of this information can come in handy strategically when you're ready to make an offer. StreetEasy has an app for iPhone and Android where users can save searches and get periodic email updates that reflect new listings under their terms. Savvy buyers with specific wish lists can narrow down their searches with ease here. When expanding your search to individual brokerage websites, keep in mind that user experience varies widely, depending on the amount of money and tech talent deployed by a particular brokerage. Also be aware that a brokerage may give more emphasis to its own listings versus competitors' listings obtained through REBNY and other feeds. 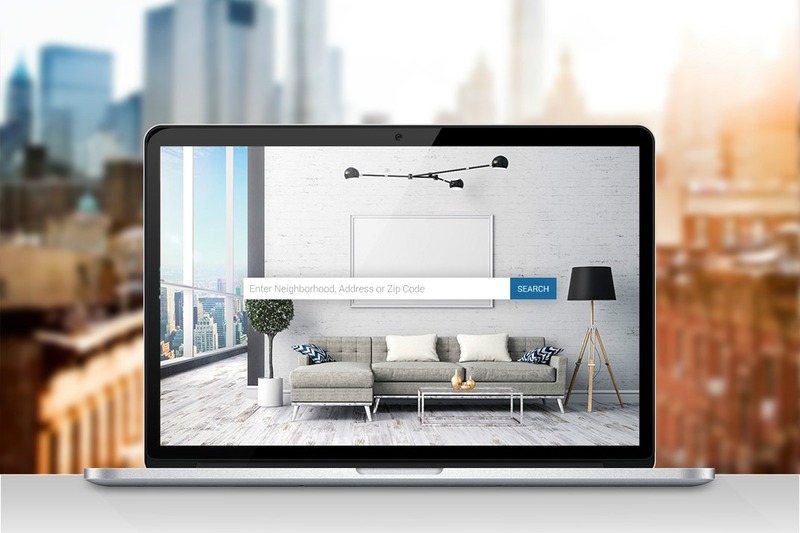 Pro tip: To gain a competitive edge over buyers who rely only on the listings platforms above, visit a variety of brokerage websites and sign up to receive alerts about newly listed apartments that fit your criteria. The reason is that brokerages that belong to REBNY (this basically includes every brokerage in Manhattan as well as many brokerages in Brooklyn and Queens) have up to 48 hours to share their listings with other REBNY brokerages. During that 48-hour period, brokerages can market listings exclusively to their own buyers in hopes of capturing both sides of the commission, meaning if you sign up for an alert, you may get a jump on an exclusive listing during that time. We've listed some reputable brokerages below. For a more extensive list of REBNY-member brokerages, click here. 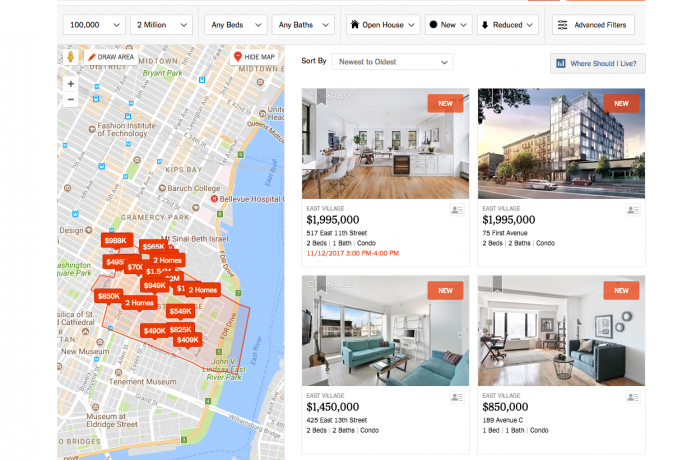 Brokers are upset about it, but what does StreetEasy's new "premier agent" feature mean for buyers?